There are reasons to believe that redistribution can’t fix all of the problem, or even most of it. If you do the math, you discover that in the long run, income levels and initial wealth…are not the main determinants of wealth. They are dwarfed by…savings rates and rates of return. The most potent way to get more wealth to the poor and middle-class is to get these people to save more of their income, and to invest in assets with higher average rates of return…In addition to “nudging” middle-class and poor Americans to save more, we can help them get a better return on their assets — the second thing that has a huge effect on wealth in the long run. In 2012, the most common response to this question was 1, that is, that generating return is a very unimportant consideration in household’s saving behavior. Two other questions ask how important it is to save “so that I have some extra money to spend when I’m retired” and “to cover unforeseen expenses.” The most common answer to both of these questions was 6, with most respondents choosing 5, 6, or 7. In short, even though most respondents understand some reasons for saving, they do not see much importance of saving to earn interests or dividends. This data is from Dutch households, but American households are probably similar: many people likely do not realize the power of compound interest or understand how getting a good return on assets has a huge impact on wealth in the long run. In the chart below, I plot responses to the question about the importance of saving to generate income from interests or dividends in 2012, grouped by people without and with a university education. The university-educated group rates this as somewhat more important. Respondents are also asked to self-report their level of financial knowledge. In the second graph I plot the fraction of people who respond 5, 6, or 7 by self-reported financial knowledge. 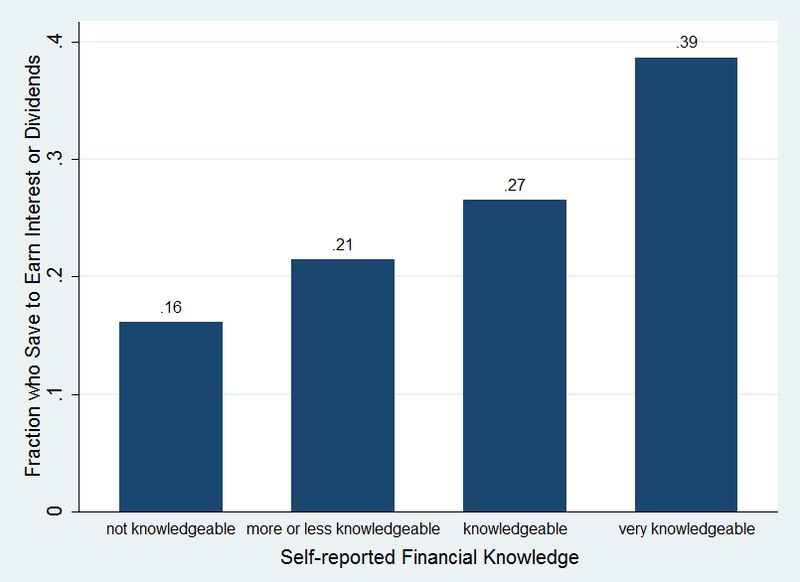 Only 16% of people who say they are “not knowledgeable” think that saving to generate income from interests or dividends is important or very important, compared to 39% of “very knowledgeable” people. I think this lends some support, however tentative, to Noah Smith’s proposal to teach the public more about how wealth builds over time and why it is important to get a good rate of return. If people don’t really grasp the importance of earning interest, then they are not very likely to make an effort to get a good return, which doesn’t bode well for their future wealth. And knowledge does seem to help. We could also admit that we have a vast pool of “citizenry” unwilling or unable to provide for itself. What you give them they will spend. What they make is little because they provide little value. As their percentage grows due to reproduction the productive portion of society will have to bear a larger and larger portion of their wealth to support them. As the inevitable inequality grows, they will resent the people who provide them both for providing them and with providing too little. Holland does not have that problem on the same scale. Same for another favorite Norway. You have egalitarian societies where the human inputs into those societies are more or less equal – not otherwise. Liberals should read a little of Darwin whom they so love to promote when it’s convenient for them to bash the Bible but not so much in other instances. I don’t have much knowledge on how financial system works, but as a student I don’t personally see a benefit in interests or dividends through savings. From a personal experience I only get few cents in interests from bank by saving a certain amount of money. Maybe it works for wealthy folks who save a large amount. Nonetheless, wonderful blog! cheers! The USA and NL are not at all similar Ms. Binder. 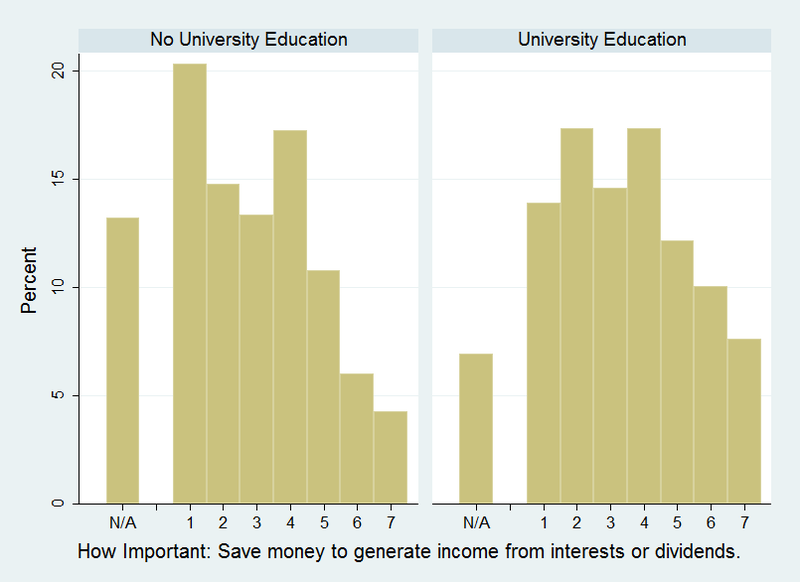 I am actually a bit surprised that the difference of opinion on saving between university grads vs. non-university grads is not larger. Would have expected a much larger disparity – in any case, it is clear that more public education is needed. It so true. People tend to think in the short term and not so much about the long term. If somebody is broke, then perhaps they should practice the habits of wealthy people. Giving them money doesn’t solve the problem, but perhaps training them to think like wealthy people will. I have steadily saved for my retirement for at least 25 years. In that time my employer has given me less that 10 raises, all due to the fact that funding was cut and they couldn’t afford to give raises to staff. My expenses have gone up while my salary has really not gone up much. My saving rate has stayed stable. I’m risk adverse so I invest in very low risk types of things. My rate of return has pretty much followed my income growth on the job, practically a flat line. Your article brings up interesting questions but only looks at part of the problem. More income would have meant I could have saved more. A better market over the 25 year time span would have meant the money I had invested would have gotten a better rate of return. The tragic fact of life is that there is not one single leader, not one single institution in the world that is making life any better for the poor since Jesus gave his life for us. We keep proving that there are simply not enough people in any institution or group that really care enough to make the right things happen or we would not be in the state of chaos and decline we are in today. We have totally failed to overcome our biological limitations even though we have had more than enough advantages and opportunities to do so. The Greatest Generation is the last group to truly save the human race from destruction, and every generation since then has failed to take advantage of that opportunity. Today we have worldwide communications technologies that a major portion of the human race has access to and not one group is making the right things happen, even with this greatest advantage and opportunity in history to save us from ourselves.